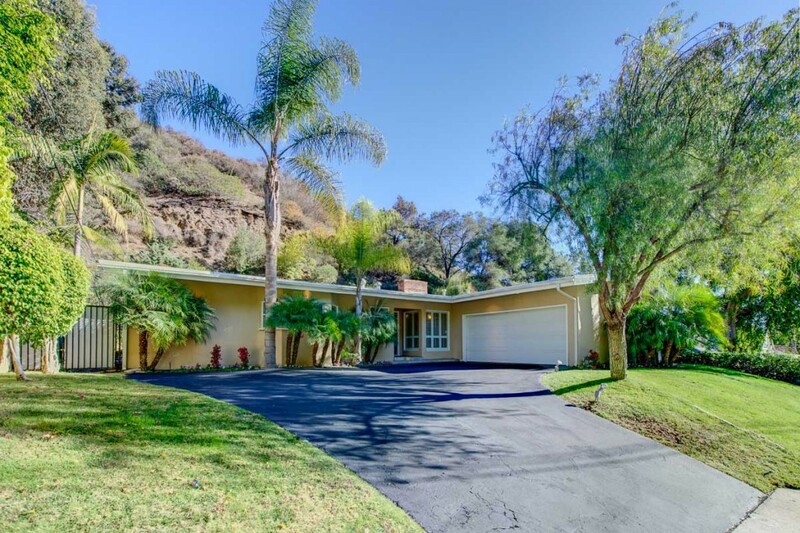 Perfect 3 bedroom, 2 bath contemporary ranch style home on large lot in coveted Bel-Air. Home is set back and perched above the street and is surrounded by lush grounds. House boasts a terrific floorplan with most rooms opening up to the spacious flagstone backyard complete with large sparkling pool and abundant space for outdoor entertaining. There is an additional wide side area off of the kitchen that provides even more outdoor space if needed. Interior features include a bright open living room, formal dining room, large Spanish-tiled kitchen with eat-in breakfast area, private master suite with attached bathroom and 2-car garage. Additional amenities include high wood-beamed ceilings, floor-to-ceiling glass windows and doors, hardwood floors, plantation shutters and 2 fireplaces. Property is located in the highly desirable Roscomare School District. Move-in and enjoy this home perfectly “as is” or update and expand as desired. Amazing value for Bel-Air!